This Green Curry recipe features chicken but could also be prepared with beef, pork or fish. If sweet basil leaves are not available, you may substitute European basil, or leave it out altogether. Serve this dish accompanied with a cooling soup, like Glass Noodle Soup (Gaeng Joot), stir-fry or steamed vegetables and of course steamed jasmine rice. In a wok, heat coconut cream over a medium heat until boiling. Add green curry paste and stir well over a low heat for about 10-15 minutes or until just glossy. Add chicken and boil for another 5 minutes. Add seasoning sauce and coconut milk and bring to a boil. Add baby eggplants and continuing cooking for another few minutes until cooked through. Add kaffir lime leaves, sweet basil leaves, and fresh green chilies. Remove from the heat. Spoon into a serving bowl. Garnish with sweet basil and fresh green chilies. Notes: To make baby eggplants green, add to the curry and press the eggplants into the curry with a ladle. Do the same with the kaffir lime leaves and sweet basil leaves. 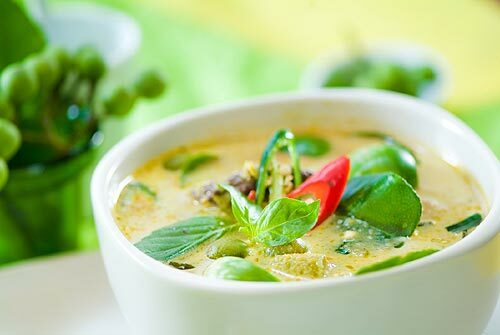 Read more about Thai Curry and the different varieties in Thailand. Another Green Curry Recipe with Beef. Preparing your own curry paste will give the best results but is time consuming. So if you need your curry in a hurry and don't wish to compromise on taste, we recommend ready-made Nittaya brand Green Curry Paste. Nittaya is a quick & simple alternative to homemade curry paste. It's the best prepared curry paste we've tried and we're sure you'll agree.